Issue Cloud Analysis offers a way to determine the prominence, currency, or relevance of specific terms in a given source set(s) or sphere(s). What are key terms among participants in the public consultation on smart metering? How do ‘elections’ feature in pro and con SOPA and PIPA web sites? There is currently a variety of tools available to detect and analyse the currency of terms online, such as Google trends, Google Insights for search or Yahoo Clues and platform-specific tools of content analysis such as twitter analysis with mention mapp. The mapping of current terms or emergent key words is further facilitated through proliferating visualisation techniques in the context of tag clouding, such as Wordle or Tagxedo. As a method, the distinguishing feature of issue cloud analysis is that it begins by delineating specific spheres or issue spaces, and only then queries these spaces for issue terms. Issue Cloud analyss measures the resonance of issue terms in specific sourcesets, delineated by the researcher. There is then a key difference between querying a whole medium (or platform) and querying a specific social, issue or organisational sphere. In the first case, one measures the currency of a term in a given medium or platform (Facebook or the web). In the second case, one measures the resonance of issue terms in a specific set of actors or sources. A related but different method compares different platforms in order to analyse the composition of issues, see Issue Profiling recipe). What kind of space is a sustainable home? Trace occurance of issue terms Use the Google Scraperto query the selected source set(s) for the identified key words. You will receive issue term clouds listing the number of occurences of each term in each website queried. 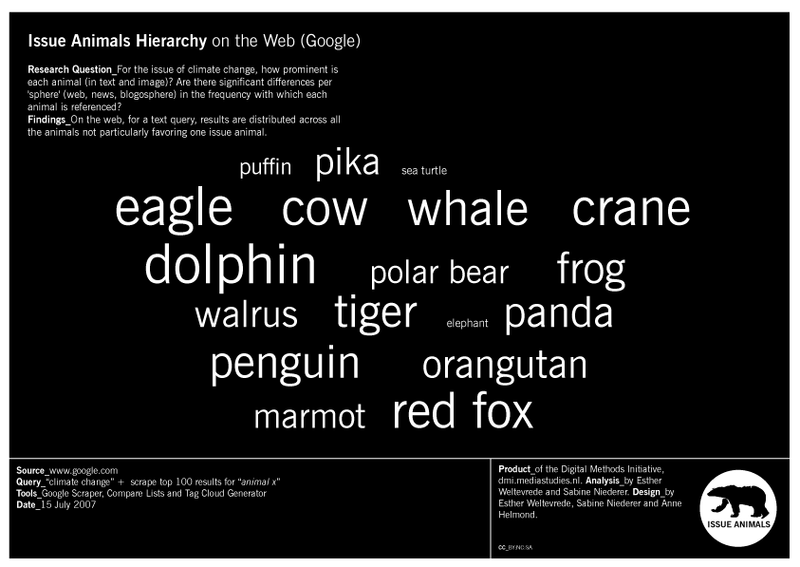 Use the in-build visualisation tool or export the resulst to Wordle or Tagxedoto visualise the findings as tag clouds. The relative size of the issue terms indicates its proportionate prominence in the source set(s).